The owners of this historic house situated in the corner of the Pont de Pedra in Girona, the Pèlach Busom family, has commissioned our studio, over the years, several partial alterations on different parts of the building. 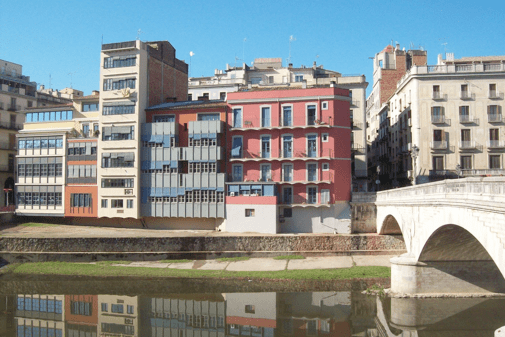 The first phase, executed in 1990, consisted in alterations to the roof, the ceiling structures from the first and second floors, the complete redistribution of the apartments on the second floor, as well as the entire restoration of the river-side facade. In the second phase, in 2001, the alterations were focused on renovating the facades facing towards the Pont de Pedra bridge and the Santa Clara street. In 2008 a third intervention on the building was proposed, and consisted in replacing the ceiling structures in the mezzanine -which were in bad condition, based on an evaluation by means of a number of perforations. The layout of the first floor apartments was rearranged, after removing all the internal division walls to be replaced with a simple housing programme with two rooms and open plan as far as possible. In this phase there was also a partial change to the ceiling of the ground floor. The basement structure was reinforced and the shop –the old Rellotgeria Pla clock shop- was remodelled, removing the lower ceiling, to create a larger and taller open space while preserving the space at basement level facing the river.